The fun of multicoloured tracking markers on screens. Some ideas for marker choices, placement on set and removing them in comp. If you are supervising a shoot you have many choices about what colour tracking markers to use. It ends up being a balancing act of trying not to make the compers life miserable but also having the markers stand out. Easiest for compers is of course to just have different green markers on a green screen or different blue markers on a blessed screen (ie if you have a bright screen have darker markers or vice versa). Where this can sometimes fall apart for the matchmove is when you get a lot of motion blur or the screen gets terribly defocused. What I’ve used successfully over the years on action shots is a particular fluoro yellow for the markers that is almost a bright light green but with enough red to be a yellow. What this allows you to do is key with a green screen keyer (same process you’d do with markers of same, but darker, colour as screen), and in tracking if you look at just the red channel, the trackers are visible even in defocused or blurry situations. As always, do camera tests before you start to find just the right color to work for you. Another tip is if you’re using a decent Digi green or blue screen and you want markers you can quickly throw on the screen or move with little hassle, make up some markers using velcro (hooked side). On most modern screens the markers can write literally be thrown on the screen and will stick. Even handy if you have pre-marked the screen using coloured gaffer tape markers but they go for a close up and you see no markers are in shot. In this case you can quickly throw a couple of trackers into frame (faster than tape). 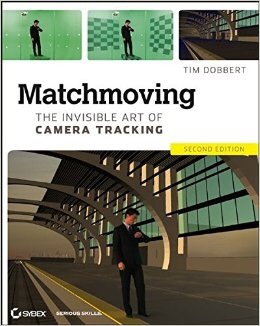 If you want to matchmove a shot you really want to have things at different depths for the software to use that parallax to work out the camera movement. You can either add green sticks (or c-stands) just out from the screen with markers on or make sure you have props with trackable textures. In that regard, work with the art Dept to make props, set pieces, that have some features that can be tracked built in (so the audience just sees a normal prop, the matchmove artist has decent textures to track in the set, & the comper doesn’t get angry having to paint out coloured dots on the set). Again, camera tests before the shoot will tell you what you need for your particular situation. Shapes of markers is a subject that’s debated. Crosses are favored by some as one cross can provide multiple points to track which can help in frames where you don’t have many markers in view. The down side is when they get out of focus their shape becomes a bit like a blobby cloud which can change frame to frame and upset the tracker. Because of this, some match movers prefer round dots (of course that means you need to make sure you have at least 7 in shot at any one time, at different parallax distances for a matchmove (unless the set has trackable features). Heres an article and video about that. For those not on the shoot but handed coloured markers on screens that need removing you can try having a look at this (click here) Nukepedia written article for inspiration. At the end of the day you’ll most likely have to endure some paint work if the above doesn’t work but creating a garbage matte so you only deal with stuff crossing close to the edge of your subject will limit this pain. Here are a couple of videos HollywoodCamerawork did as an intro to matchmove marker placement (from their vfx course). * note that the image at the top of this article is also from HollywoodCameraworks site (click here). If you want free vfx plates to practice your keying or tracking check them out. Also their camera work course is awesome and I’ve found the vfx course good to help explain certain techniques to directors in the planning stages.